Last week I learned a lot about the Tambul tree during a five day working visit with Ronald to Assam. It is used by the local people in many ways. Culturally, the Tambul (betel nut in Assamese language) tree grows in every household in eastern India. It is a mouth freshener. Served with an edible Paan leaf & anise seeds, the nut is chewed as a palette cleanser. Ronald and I had a firsthand experience one afternoon, when we were offered tambul in a beautiful brass tray after having tea. 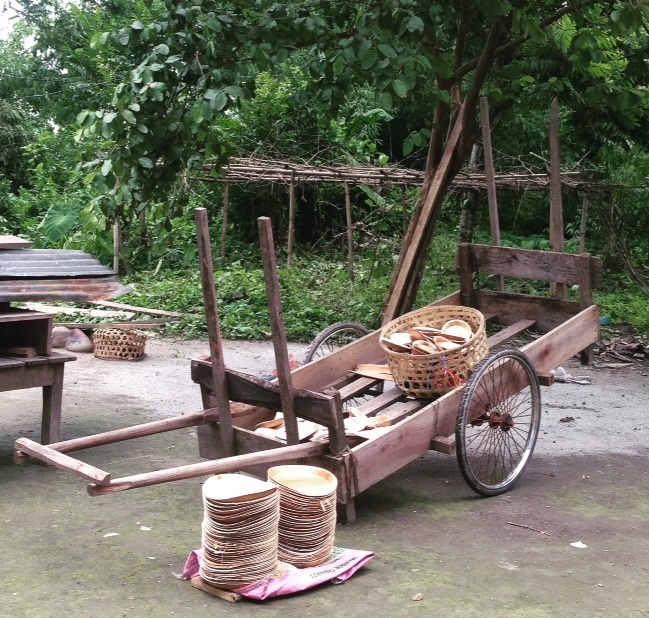 We were in Assam to assess potential new business partners, like Tamul Plates Manufacturing Private Limited (TPMPL): it produces molded disposable plates, using the thick leaf sheath of the betel nut tree. The market is the burgeoning middle India, especially at religious and festive events. At these times food is always served and disposable leaf plates a norm. Tambul plates are a value added product in this market, evolved from the hand stitched patal plates. Also eco & pocket friendly compared to the thermoset variety. Mr. Arindham Dasgupta and his TPMPL team have been working in collaboration with the government to create awareness towards livelihood in rural & peri urban Assam since the last ten years. Based on the experience gained, TPMPL was started in 2009 to create a bench mark production unit. The plan is to replicate the model for small entrepreneurs. This production facility is rooted in its ability to use local resources – people, raw material & the final market. A local entrepreneur is required to invest in the basic set-up, a die-press for molding plates & bowls. Space and human resources are available within the house-hold unit, at least to begin with. Raw material is easily available in the vicinity. A single tree yields upto 20 leaves a year; this is a good average for production when bought over time. Moni Ram, one of the local entrepreneurs, runs a production unit with capacity of 1,200 plates per day, with the help of his wife and daughter. During peak production up to 5 women from the neighborhood are at work. Production requires patience and routine. E.g. the constant supervision for drying the leaves, washing, and pressing are all repetitive, almost with a meditative quality. TPMPL and Women on Wings will join hands in realizing the ambitious goal for the next 5 years, based on this model. Wonderful that this generous tree will generate large numbers of new jobs for rural women, both in producing the plates and collecting the leaves.